Tony Albert contrasts the strength and dignity implied by the word ‘hunter’ with a debased view of Aboriginal people and culture as represented by the kitsch tourist souvenir-ware featuring ‘portrait’ heads. Albert collected similar material as a boy and uses its familiarity to many Australians as a means of engaging serious thinking on racist discrimination against Aboriginal people. 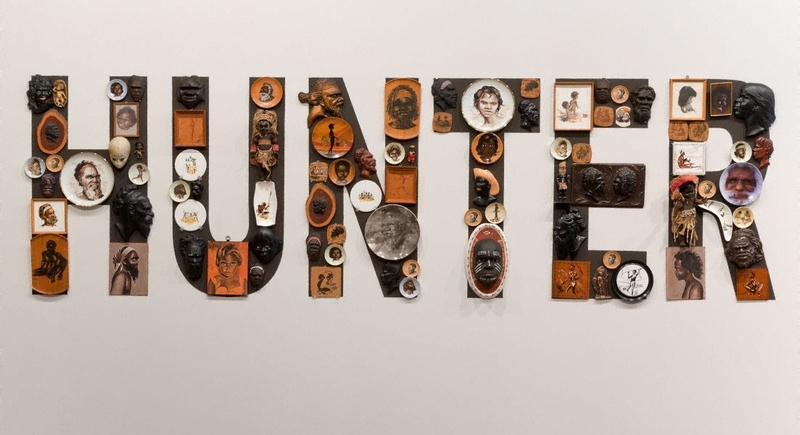 In this context, the word ‘hunter’ implies the Aboriginal hunter of pre-settlement Australia, the white colonial hunter of ‘Aborigines’ on the frontier and the artist himself as a collector of these wares. The white plastic ‘alien’ head on the letter ‘H’ is Tony Albert’s signature reference – intended as a symbol of cultural alienation and displacement by Aboriginal people within Australian society. q - plastic doll with traditional dress , 15 x 14 x 10 cm, This doll is dressed to represent a woman from Papua New Guinea. It is circa 1970s in date [advice from Natalie Wilson to Helen Campbell, 3 Nov 2016]. mmm - plastic doll with traditional dress , 36 x 16.8 x 16.5 cm, This doll is dressed to represent a woman from Papua New Guinea. It is circa 1970s in date [advice from Natalie Wilson to Helen Campbell, 3 Nov 2016].